Lakes, wetlands and ponds, are the collection pools of freshwater. Rain is their primary source and responsible for depositing most of the freshwater on planet earth. Surprisingly, all the freshwater sources put together, glaciers, icecaps, icebergs, rivers, groundwater, along with lakes, wetlands and ponds, form just about 3% of all of earth’s water. Further, it is a small portion of this freshwater that is consumable or drinkable for the entire world’s population of close to 7 billion people! While these freshwater sources seem to already project a stunning impression, it doesn’t stop just there. These wetlands are like the lifeline of any region. They help restore and maintain the groundwater levels and water tables. It is the severe concretization, unchecked population growth and the overexploitation of resources by man that has been directly affecting the groundwater levels, especially in the urban areas. Despite that, lakes and ponds act like an oases of calm and stillness, amidst any busy bustling city. And within this stillness, they create a magical ecosystem of the flora and fauna. The life they hoard, and the haven they create for a diversity of life forms is quite a marvel. With the many wetland bird-watching trips, nature walks, wetland projects and lake surveys I have been apart of over the past few years, a fondness to wetlands had grown on me. 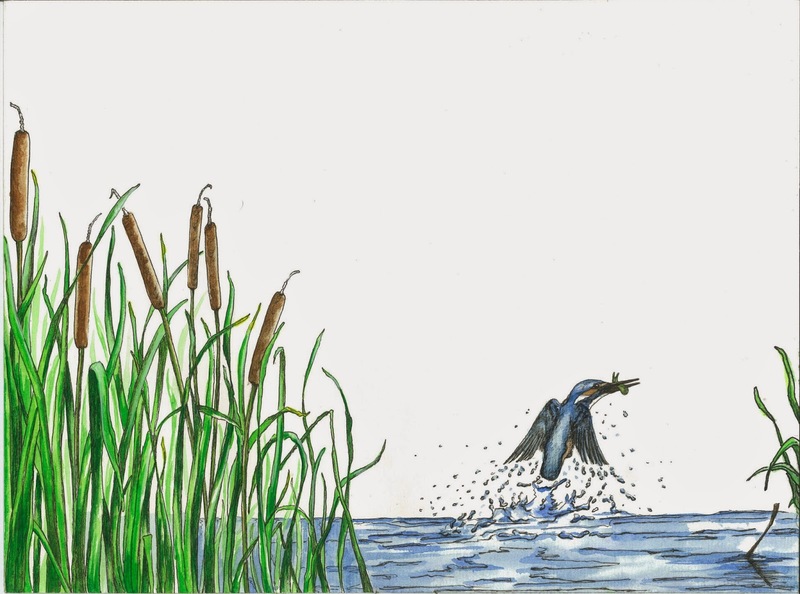 It was in October 2013 when a phone conversation with Mala Kumar, the editor of Pratham Books, sprang an unexpected discussion about a children’s storybook that involved three of my favorite elements – rain, lakes and wildlife! However, I had never worked on a Children’s storybook illustration ever before. Bundled with a lot of apprehension, anxiety, excitement and eagerness, I decided to wake up to the new challenge that was thrown my way. I was more than happy to be illustrating a story authored by Ashish Kothari, who is well known amongst the environment and conservation circles, and is the reason behind ‘Kalpavriksh’, an environmental group in Pune. Soon, the story was followed up with a pagination, which helped me compose each page with the required story elements. The author, Ashish Kothari, beautifully narrates in the story, his move into a new home in Pune; a little pond that his balcony overlooked and the exciting transformation the monsoons bought in along with an incredible variety of birdlife, insects, amphibians, mammals and reptiles that began to inhibit the little ecosystem. He continues to talk about how the lake was suddenly threatened by urban development, and how the people from the neighbourhood came together to save that mini-sanctuary. I started work with key sketches for each of the pages & a couple coloured plates to decide the style, soon there was a go ahead. Juggling with another project at hand, I probably took about two whole months to finish all the 15 page illustrations for the book. The artworks were couriered off to Delhi to scan. The text was inlayed within the art and in a few weeks, the .pdf version of the book was shared for final edits. At the same time, the translations in five other languages - Kannada, Hindi, Marathi, Telugu and Urdu were underway. 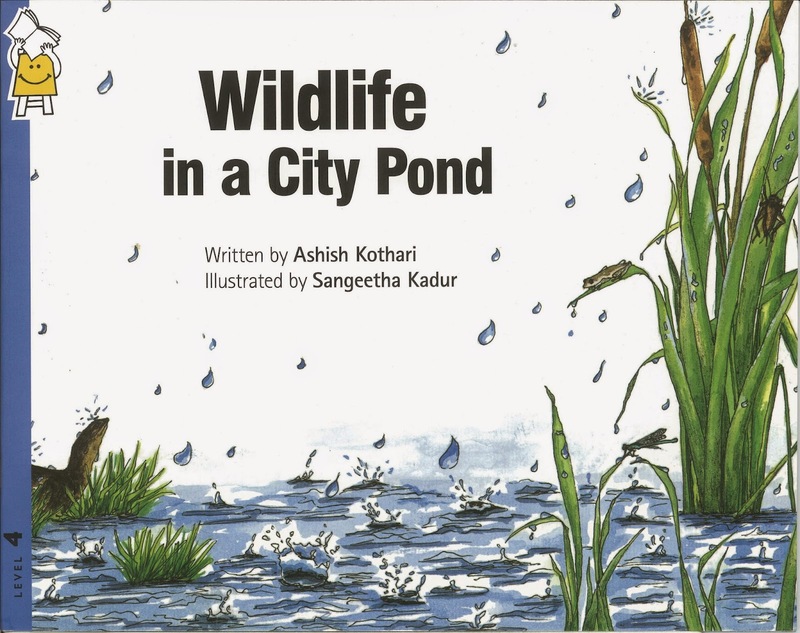 Finally, in August 2014, the book ‘ Wildlife in a city pond’ was added to the Pratham online library. I am happy to mention that this storybook falls under the Creative Commons license (CC-BY-SA 4.0), and will soon be available for free download ! Small Blue Kingfishers love clear water as it helps them spot their prey easily. They sit around on reeds, low shrubs and rocks along the water edges, to dive into water to catch their meal for the day. Tall grassy Bulrush reeds with brown rods inhabit any wetland habitat. 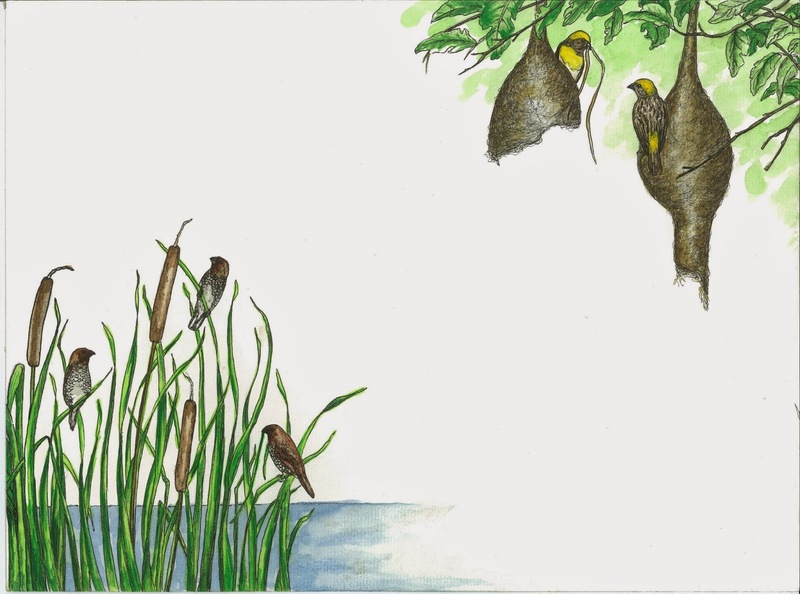 Scaly-breasted Munias and Baya Weavers fly away with thin blades of reeds to build cozy homes to lay eggs. Baya Weavers are known to build intricately woven nests that are left suspended from twigs and branches hanging over water. Life co-exists in a wetland! 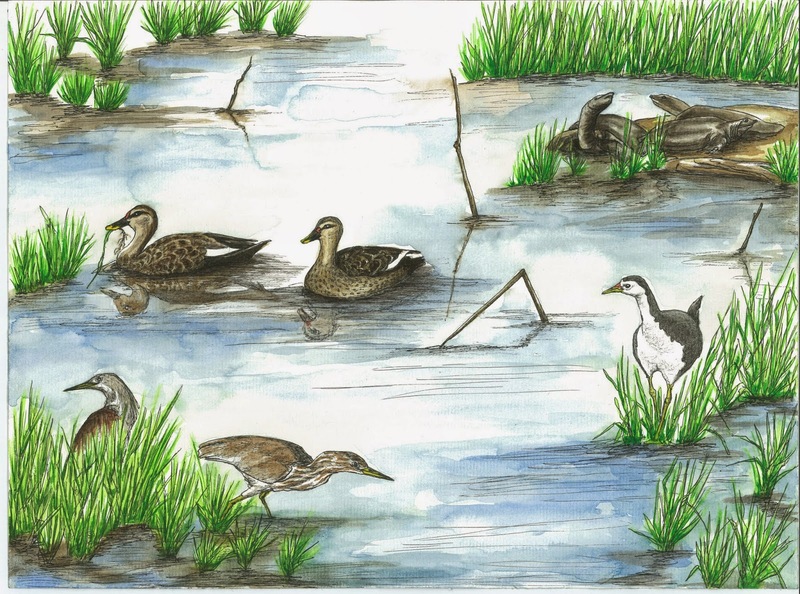 The White-breasted Waterhen walks with an elegant gait along shallow grassy patches, while Spot-billed Ducks take to deep water where they can swim. Pond Herons too, wade through shallow water, hunting patiently. They freeze for many minutes, cautiously looking around, and in an instance, strike to kill! While all the drama unveils, the Flapshell Turtles silently bask in the sun. 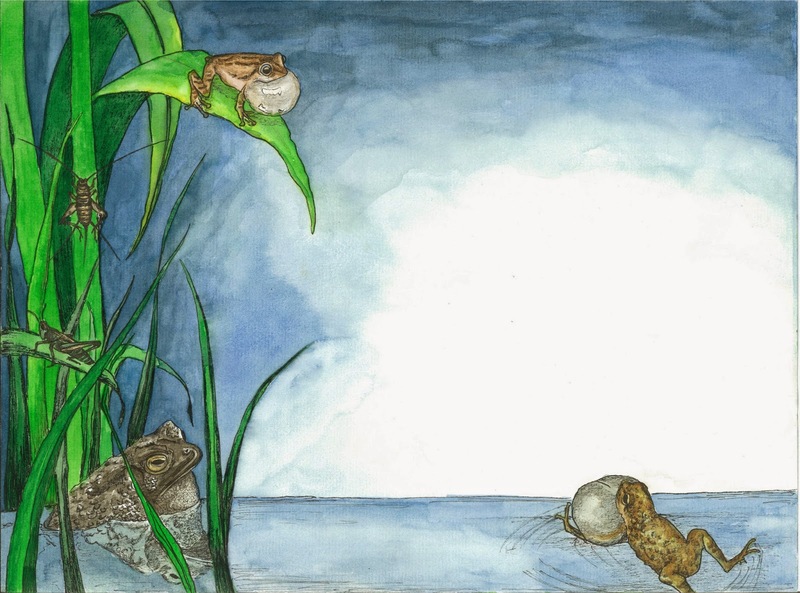 The cacophony at night from the pond might feel creepy, but you will find the source to be nothing but harmless little frogs, toads and crickets crackling away in the darkness. With big enlarged pupils, Spotted Owlets and Nightjars are wide-eyed and awake through the night. 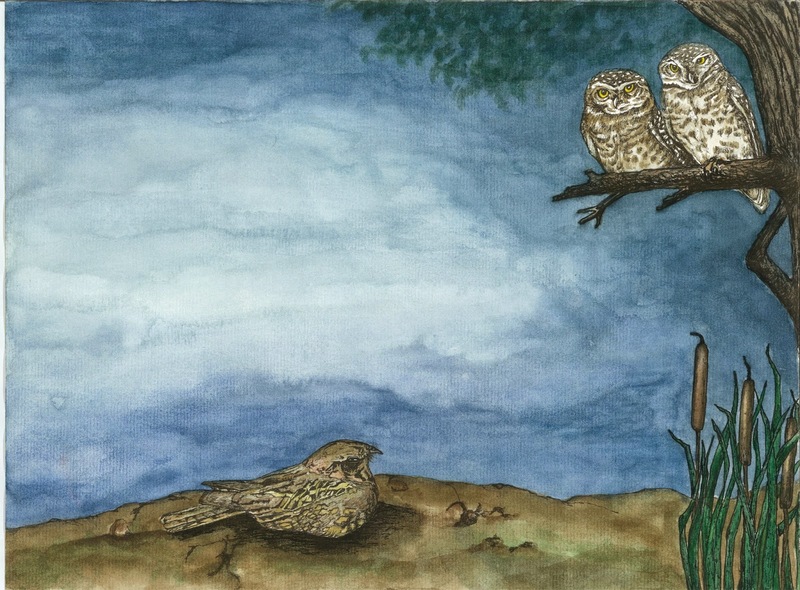 While Spotted Owlets love to hunt rats and mice, Nightjars catch insects with their wide mouths.